Some things He said with such determination that those who listened could hardly believe their ears. 'Do not give dogs what is holy,' He said, 'and do not throw your pearls in front of pigs, or they may trample them and then turn on you and tear you to pieces' (Mt. 7:6). 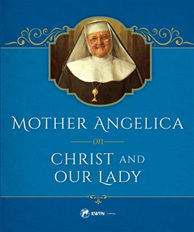 Below is an excerpt from Mother Angelica on Christ and Our Lady, published by Sophia Institute Press/EWTN. Thanks to Molly Rublee of SIP for permitting me to publish this excerpt in my column. Click here to order a copy of the book. We are all so conscious of the gentleness of Jesus that we tend to forget His great determination. It was at times demanding, but never overbearing. For example, He was determined not to use His Divine Power to alleviate any of His personal sufferings or problems. We see Him fleeing into Egypt to escape the tyranny of an evil King whom He could have annihilated with an act of His Will. Instead, He would be as other men and suffer the consequences of jealousy and ambition. He patiently waited until the King died before He returned to Nazareth, and then lived an ordinary life. It was so ordinary that He was looked upon as any other child of His day. When He was twelve, and Mary and Joseph brought Him to the Temple, He did not hesitate a moment to withdraw from them, even if by doing so He would cause them untold grief. On the surface, this seems cruel, but in reality it manifests a determination to accomplish the Father's Will at any cost. It was time to plant the seed of His coming in the hearts of the leaders of His day, and He had to do it alone. Though He was sympathetic with His Mother's grief, He was undaunted in His explanation that God's Will must be first in their lives (Lk. 2:49). He was a Man who knew what He was about, and no person or thing would deter Him from doing what He was sent to do. If and when the time came to correct those in authority, He would do so no matter what personal risk was involved. He ate with sinners and had compassion on the weak, knowing that such behavior aggravated the Pharisees and Scribes. Unlike John the Baptist, who castigated with words, He would lash out by actions and uncover the hypocrisy of His critics by questions that had no answers. Some things He said with such determination that those who listened could hardly believe their ears. "Do not give dogs what is holy," He said, "and do not throw your pearls in front of pigs, or they may trample them and then turn on you and tear you to pieces" (Mt. 7:6). Many Christians today think virtue should be a companion to evil for peaceful coexistence; Jesus, however, never left any doubt in the minds of His listeners as to His stand on sin. He had compassion on the sinner, but His hatred of sin went so far as to make Him say a man who thinks adulterous thoughts has committed adultery. This is strange in the light of His treatment of the woman taken in adultery. "Has no-one condemned thee, woman?" "No-one, Lord," she replied. "Neither will I," He answered (Jn. 8:10-11). How could He be so determined and so compassionate at the same time? The answer must be in the fact that He realized how strong the temptations of the Enemy can be, and how much the Enemy hates every human being. He understood how difficult it is for poor, fallen human nature to overcome the onslaughts of a superior intelligence. He saw sin for what it was – a lie and a rejection of God as Father and Lord. He saw the deception behind every sin and temptation, and He had compassion on the sinner, but He never condoned his sin. He was determined never to compromise the two Kingdoms, and He knew of what we were made. Therefore, He could look upon sin with Divine vengeance, and upon the sinner with Divine Mercy. He wanted His followers to have the same spirit of determination as He. One day when He saw great crowds all around Him, He gave orders to leave for the other side of the sea. One of His disciples said to Him, "Sir, let me go and bury my father first." But Jesus replied, "Follow Me, and leave the dead to bury their dead" (Mt. 8:21-22). Was the disciple the son of a Pharisee or Scribe, whom the Lord had described as whitened sepulchers, full of dead men's bones? If so, it would be better for him to let these spiritually dead men bury his father while he followed the Master. Great detachment is needed to follow a man of determination. Whenever the test of loyalty came, he would be asked to put his hand to the plow and not look back, for if he did, he would not be worthy of the Kingdom of Heaven (Lk. 9:62). A marvelous quality Jesus possessed was His ability to maintain this spirit of determination in the face of failure and contradiction. He knew the things He said and did would separate father from son and mother from daughter, but this knowledge did not deter Him from saying what He had to say and doing what He had to do. He went so far as to say that unless we took up our cross and followed Him we would not be worthy of Him (Mt. 10:38). Yes, He could tell His followers that the Kingdom of Heaven was "like a merchant who found a pearl of great price and sold everything he had to purchase it" (Mt. 13:45-46). A man must have a sense of priorities and be willing and determined to sell all and give all to arrive at the goal God has set for him. It takes great will power and that is the essence of determination – the will to be like Jesus, no matter what the cost. We see His entire life as a reaching out to see and do the Father's Will: searching for the sinner, castigating sin, manifesting compassion for the sick, and being an image of the invisible God. Everything else would come and go, but He would never swerve from this purpose and mission.